Lily writes in again with her final Summer Institute blog post. Thanks so much, Lily, for your hard work during the Summer Institute and for all you've done for SHOFCO and KSG. This is my final post (for this year), so I’d just like to say thank you to everyone who dedicated their time to reading about my incredible adventure. Our last week began just as every other week had before. We left for the school early Monday morning, everyone returning from their sick days. The younger girls had no idea our time was running short and the older girls had no more than sneaky suspicions. It was only Monday. My morning lesson was co-taught by Aaron, a rising sophomore at CU Boulder. Sitting on the playground one morning, the two of us found that the playground had numerous unused tires. In the spirit of using what you’ve got, we decided our next lesson would be nothing other than tire bowling. The girls would build towers of tires (say that 5 times fast) then use one giant tire to try to knock down the other girls’ tire towers. We split the girls into two teams, had them create team names and compete to knock the tires down. HUGE SUCCESS. We were given older girls, and as they created their towers, they formulated strategies, discussed architectural techniques and tested their towers before presenting them to the other team. Oh, the team rivalries that ensued! If I’ve learned one thing from working with kids (taught me by my brother, Lee) it’s that asking them to create team names is a brilliant way to get them into an activity. The first-graders, one of the groups we had, eagerly presented their team names. Aaron’s team proclaimed themselves The Flying Shining Princesses! My team proclaimed ourselves The Flying Princesses! Congratulations Elizabeth on producing my favorite quote of the Summer Institute and for becoming the hero of The Flying Princesses. And so it went, and tire bowling became my favorite lesson, despite the sunburn that made itself at home on my neck. Back in the world of Pre-K, without the Chapin teachers literacy hour morphed into migraine hour; I grasped any book I could find that would settle the girls down. We found a Dr. Seuss dinosaur book in which The Cat in the Hat presented different dinosaurs to a group of very Dr. Seuss-y looking children. The instant I showed the girls the cover, the class fell silent. I saw fear in the children’s eyes. I made an executive decision to talk about the pictures instead of reading the words, opening the door to a scintillating conversation about dinosaurs, cats with hats, and children wearing bizarre outfits. -Girls, this is an apatosaurus. -Teacha, this animal is a copy cat. -Teacha! This animal is copying giraffe. Its neck is copying. -Actually this animal came first! Really the giraffe is copying the apatosaurus. I see the sadness on their faces. Their beloved giraffe is a fraud? I try to recover. - No, but it’s okay! The apatosaurus is dead now! The giraffe is okay! The sadness switches to confusion. I change the page. - Girls look! It’s a T-Rex! -Teacha take this snake away from me! We move to simpler terms. -Okay girls! This T-Rex is a bad guy! He eats other animals. This triceratops is a good guy! He eats trees! The girls grew concerned about the fate of the Seussian boy and girl who appeared on every page. Not wanting to get into evolution just then, I lied. That settled them down, so I continued with my valuable lesson in which I described dinosaurs as either good guys or eaters of small children. I knew something had gone horribly wrong but couldn't look back. We figured the more we did, the less time we would have to think about our impending departure. But it truly never left our minds. On Thursday afternoon, during a weather lesson with the younger girls, all I could think of while talking about sunny weather, windy weather, rainy weather, and it sort of looks like rain but it’s white and falls slowly from the sky mostly up country and it’s like the ice you see in drinks weather, was about how this was my last class of girls and how much I would miss their beautiful beautiful faces. And then BOOM it was Friday. The last Friday. HOW DID THIS HAPPEN SO QUICKLY? Each homeroom was asked to prepare a song, poem, or performance for the final assembly. The girls’ families were invited. We spent Friday morning with our homerooms practicing, and our 15 Pre-K girls nailed an adorable two-song compilation, including Bill Withers’ “Lean On Me.” Think of something adorable. Now multiply that by 1000. That is what these girls looked like. (Here is a video of their performance in the Great Hall). Some of the teachers helped set up the Great Hall, and when we finally entered it in the afternoon, the girls’ art hung from every wall and from the ceiling. As the girls entered, they looked around in awe. But I’ve left out the best part. One of the full-time Pre-K teachers, Teacher Rita, decided it was NECESSARY to begin the final assembly with a fashion show starring all 40 of the Pre-K girls who’d been instructed to bring their Sunday best. As lunch ended, 40 Pre-K girls crowded into one of the classrooms and several teachers began changing them into their outfits. I saw floral outfits I’m sure my Mom would have loved 40 years ago. I saw some denim suits. I saw some tiny ball gowns. Then Teacher Rita made the decision to put eyeshadow on 40 Pre-K girls. A giant line formed that weaved around the classroom as the girls, all in their Sunday best, waited for some shimmer. As I watched the girls admire themselves and each other, all I could think of was the oft-used adjective here: “shining.” You are a shining girl. You are a smart shining girl. You shine like a star. Elizabeth in all her sassy glory! As we counted down the minutes until the start of the final assembly, I didn’t want to let my girls go. Saying goodbye last year was one of the saddest and most painful experiences I’ve ever had, and the luck that brought me back to SHOFCO this year brought me right back to these final moments. When is the next time I’ll see my little girls? Will they still be little? My thoughts were cut short as word went out that the families were ready and waiting, the girls were all seated, and it was time to line up the Pre-K students for their grand entrance. And THEN...it started. If you watch no other video I’ve linked (sorry I got technologically fancy in the end) WATCH THIS ONE. I cannot describe it. You must watch. Sorry for the quality, but not really. Why can't I catwalk like them? The rest of the assembly passed flawlessly. Each homeroom had a different performance, each one wonderful and fun. The families all looked excited to be there and some even cried. I knew my own tears were not far off, but I held off until the very end. The volunteers decided it was necessary to present the girls with a poem in special KSG fashion. A few of us earlier in the week wrote the poem and presented it to the rest of the volunteers. We practiced several times, and finally Friday afternoon we presented it to the girls. Queue tears. The end of the Summer Institute was finally here, and I heard the girls begin to sing that horrible, horrible song. The girls flooded towards us, and we spent the next ten minutes clutching them, crying with them, promising to visit, giving final words about how truly shining and smart they were. The pain I felt from last year was back. The hole where these beautiful girls belonged now reopened in my heart. The girls departed and the teachers adjourned to the playground for sodas and a few last stories. Fortunately we did not yet have to say goodbye to the SHOFCO Youth. Unfortunately that farewell was only hours away. Sitting on the roof together, we cheered up a little, laughed, told stories, and noted the cluelessness of some of the youngest children. -Teacha you are crying. Are your eyes paining? Did someone beat you? TEACHA. Did Elizabeth beat you? I’ve gotten word from Alix and Nathan that some of the Pre-K girls even six days later are still confused. They ask where the teachers are, and the answer does not ease the confusion. Anyway, we all went home that afternoon emotionally exhausted. It did not feel real yet. We showered and got ready for our final dinner, the closing ceremony for the volunteers. I’ll give you one guess as to where we went for dinner. The 30 of us sat a long table outside where we talked and mingled. We ate our fill and then the speeches began. Maybe it’s part of Kenyan culture, or maybe some people had a little too much of the tej wine, but EVERY SINGLE PERSON was REQUIRED to give a speech. For my readers who know me, you know I do not do well in these situations. I don’t like talking to groups of people. My heart starts racing, I shake a little, I sweat. For those who REALLY know me, you know that the fear runs so deep that for the longest time (and my mom will argue is still the case), I can’t even talk to people on the phone whom I don’t know. My mom makes calls to Delta, Verizon, and my school when there’s a question or issue. I’m not proud, but it’s who I am. Anyway, I stood to give me speech, and I clocked in at 45 seconds. I don’t remember what I said, but when a friend told me later, it rang true. I had said that although last year sent me home filled with excitement and pride, this year I don’t really know why I’m being sent home at all. These girls are everything. They are my motivation to finish my final year of school and hop back on two 8-hour flights to Kenya. Why can’t I be with them forever and watch them grow up and continue to succeed? I already watched from afar for a year. I’ll have to do that again for another year, but why must I continue after that? Can’t I take an active role? These girls are really everything. But there is more. The SHOFCO Youth are such a wonderful, spirited group of young people that sometimes go overlooked. They should never be overlooked. They were incredible with the girls, and the girls adored them. They were welcoming to us, ready to make friends. They brought us in and made us feel at home in their group and in their lives. They shared all of our feelings of love and attachment to the girls and to each other. Some of the quieter young women, with whom I’d had less contact shed tears at our final dinner. I cried at our final dinner, too. Twice. Not sorry. Saying goodbye to them felt almost worse. Our relationships were much more complicated than our roles as teachers of little girls. They are our friends now and saying goodbye to friends, perhaps indefinitely, is heart-wrenching. And it wasn’t only the SHOFCO Youth. It was the great and inspiring American volunteers, too. It’s a guarantee I’ll see the Oberlin girls again, but what about everyone else? It’s easier to see them, but we can’t recreate what we just experienced together. Why am I listening to Adele right now? Tears are coming again. I think this blog is also drawing to an end. But first I must make a much-needed shout out to two of the most incredible people I’ve ever met: Alix and Nathan. The two of them, for their second year in a row (third for Nathan) put together a program that (I can now say after looking behind the curtain) is logistically ridiculous. The number of things they had to do in order to make this summer perfect is incalculable. Thank you so much for everything, really, but specifically for helping me help you (casual Jerry Maguire paraphrasing) If you hadn’t have brought me back, I would feel none of the drive and inspiration I feel now. Not many people can say they put together a program that changed so many people’s lives. So now you find me sitting in an empty apartment in New York City visiting friends before flying home, and I feel so torn. I’m happy to see friends. I’m excited to finally go back to Atlanta to see my family, but I’m also so devastated by the loss of my everyday life at KSG. Facebook can only go so far in connecting people. And so I’m back where I started when I first wrote this blog. Here I am again, just looking at pictures, watching videos, and endlessly leafing through love letters. In the excitement and, as you will read, craziness of the final two weeks of the Summer Institute, we didn't have a chance to update the blog. We'll make sure to cover all of the last two weeks' activities in the next week or so. It was an emotional ride for everyone involved. So, in the spirit of better late than never, here is our wonderful SI Assistant Lily Samuel's reflection on Week 3, AKA The Craziest Week Yet. Week three of the Summer Institute will go down in history as the biggest mess Sandavy Guest House has ever seen. Half of our group fell sick with colds and coughs among other issues. With the various illnesses, we were fairly short-staffed and had to do a lot of improvising with classes. What doesn’t kill you makes you stronger, right? For all you worried parents reading this blog, everyone is now happy and totally healthy (although probably not that happy as we all just had heart-wrenching breakups with our beautiful girls, but we’re not at that point in this blog post yet). For my own worried parents, I did not get sick (except for that one time when I ate a hamburger too quickly and thought I was going to explode, but that happens pretty regularly). Despite the plague that settled over our group, the week passed similarly to the previous two. Lesson plans in the mornings and afternoons, mostly edible lunches, fights over jump-ropes, and snoring Pre-Kers at mid-day. My most notable lesson plan, co-taught by Jolie, an American volunteer from Oberlin, was a dance class for older girls. But this wasn’t just any dance class. It was voguing. Voguing is a complex and fairly ridiculous dance composed of 6 elements: hand performance, floor performance, spins, dips, catwalk, and duckwalk. We demonstrated each of these aspects to the girls as they stifled laughter. We then set the girls loose to do some free-styling. After a few minutes, we split the girls into groups of three or four to come up with their own dances to Shakira’s Waka Waka. We gave these girls 5 minutes. They came up with elaborate dances that lasted 2 minutes. Now think about American dance classes for a second: 4 months of expensive classes culminated in minute long dances where half the girls go the wrong direction and the other half just wave to the audience. That is NOT what this was. The dances were coordinated and involved complex moves. The girls incorporated all the elements and even did some tumbling. Such talent. Now, if you recall last Friday, we took 80 small children to a crocodile park. This Friday, July 12th, we took 140 children to a nearby park for Field Day! This trip has been fueling my caffeine addiction a little more than I was expecting. Each volunteer was given either a station or a homeroom. Volunteers with stations would receive each homeroom in turn and facilitate games at their stations. Stations for older girls included bean-bag toss, three-legged races, the weird ball and cups game I still don’t understand, parachute, and costume relay. Stations for younger girls included running in a straight line, running in a zigzag, and running backwards. Challenging, indeed. Anyway, volunteers with homeroom groups would travel around with their group and help out at each station. I, I am proud to say, was in charge of the costume relay, supposedly applicable to all age levels. I was given two hula skirts, a marching band jacket, a vest, a hat, and a sparkly boa. I was lucky enough to have had the proper training to really succeed in this challenge. Older girls had to put on the outfits and race, younger girls only had to put on one of the items. And if that wasn’t hard enough, there was the constant bickering over the advantage the team with the vest had over the team with the marching band jacket. I mean...it was a valid point. The annual Kenyans vs. Americans Soccer game. Not to worry, friends! We made it out alive. Field Day was followed by the annual Kenyan vs. American soccer match. American volunteers faced the SHOFCO Youth and KSG teachers (all young to middle aged women). I proudly led a portion of the Pre-K cheering section, for I no longer play soccer (the wounds of shame created by my younger and much more talented siblings have yet to heal). The KSG teachers were lively in leading Kenyan chants but the girls also cheered USA! USA! as they saw their Summer Institute teachers running around. The first goal went to the Kenyans, and the girls and teachers went wild. They all jumped up and stormed the field, singing, screaming, and blowing whistles. Imagine 140 children storming a tiny field. Incredible. Teacha. Me I am hungry. Me: But Elizabeth! The Americans scored! YAY! Elizabeth: Teacha. I am hungry and my stomach is paining. Me: We’ll have lunch soon! Can you cheer now? Elizabeth on the right, after Field Day. The game ended in a tie, 2-2. It felt like a good way to end the game. That afternoon we walked back to KSG and gathered for a farewell assembly for the Chapin teachers who were leaving that weekend. Several classes performed poetry, a couple groups of girls sang, and finally the entire staff at KSG came up to sing a farewell song to the teachers. Now a little background about this song. It has haunted me for a year. The teachers harmonize this beautiful song about how much they love and miss you and it’s the most soul- crushing song I’ve ever heard. They sang it last year at one point and we all began sobbing. This year, as I sat in the Great Hall waiting for the assembly to start, I turned to Alix and told her that, if that song was sung, I would make a scene. Now I am a woman of my word, and when those teachers started singing it, the water works began. I was in the very back of the Hall and I watched as several girls turned around in their seats and looked at me sympathetically albeit bewilderedly. After the assembly ended, we said our goodbyes to the Chapin teachers and I hid in a corner to deal with my tearstained face. And with that embarrassing display of emotion from me, Week 3 ended and we headed into our final full weekend. On Saturday, the group tried to go to the elephant orphanage to see baby elephants. Fail fail fail fail fail. The driver got lost and we drove on bumpy roads in the middle of nowhere for two and a half hours before finally giving up and going to fancy tourist restaurant instead. It was delicious and I even treated myself to a tequila sunrise. 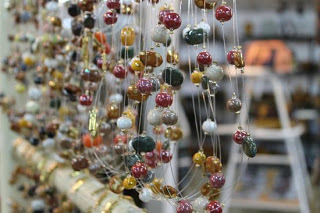 In the afternoon, a few of us went to a bead shop called Kazuri, which employs single mothers to make beautiful beaded bracelets. It was totally overwhelming, and I spent excessive amounts of money. Mom, you’ll thank me later. Out to lunch on the weekend. Saturday night, the group went to a nice Italian restaurant and then stopped in next door at a club celebrating Bastille Day. Yes, I also have no idea what compelled the club to feel the need to celebrate France’s Independence. I mean...Kenya was an English colony so there isn’t even that. Whatever, I had fun. There was a DJ and they were giving out drinks that were blue, white, and red. Disgusting but festive...kind of how I feel after eating 15 latkes on Hanukkah. It was a blast and some of us even stayed out till midnight (going crazy! ), but in perfect Summer Institute form, we still woke up at 8am. Sunday was another shopping day, and we met up with the SHOFCO Youth in the afternoon to go to Toi Market, a huge outdoor maze of small shops selling clothes, knick knacks, tapestries, food, movies, mattresses, and literally everything else you could possibly imagine. We split up and spent several hours winding through the market, looking at this or that but mostly just hanging out. I got myself a shirt that my girls later told me was very smart (smart meaning good-looking, well-dressed, or nice) so I consider that a small win. The whole day was so much fun and definitely marked the beginning of my terror and dread at having to say goodbye to such wonderful people. Every year on the Summer Institute we take the KSG girls out of Kibera and to a fun, educational location where they can learn and discover new things. This year we split the school in half, taking the Pre-K and Kindergarten students to see giraffes and crocodiles and taking the upper school students to 14 Falls, a beautiful hike to a series of waterfalls. It was a wonderful day -- enjoy the pictures below. It's been a busy busy busy two weeks here in Kenya. We've hiked and climbed and sang and danced -- and that's all outside of the school. Our wonderful SI assistant Lily Samuel is back again to share her thoughts from the first two weeks. As a participant on last year's Summer Institute, Lily's animal group -- small groups of students assigned to a particular participant for the duration of the program -- was made up of Third graders, the oldest girls at the school. This year, Lily has a group of Pre-K students that are very .... energetic. What a difference a few years at KSG makes, huh Lily? I’m happy to report that over the course of three days (Wednesday-Friday), my students’ group name has evolved from the Ostrich Animal Group to the Other Ostrich Animal Group to the Flamingoat Animal Group. Yes, I spelled that correctly. It feels like a small win for me. At least we’ve got the first syllables I wanted. My girls are adorable. They’re no more than two feet tall and are consistently out-sassing me. They are a more advanced literacy group, so we get to read books like My Garden: “I have blue flowers. I have red flowers. I have white flowers. I have a garden!” The End. It’s gripping, really. Cursive is hard to copy, and so Cujotlls George was born. The scariest elfant I've ever seen. In reality, Literacy Hour for Pre-K is actually Literacy 10 Minutes and Come-up-with-something-to-do 50 minutes. I have two other volunteers in my homeroom, an American guy from Wesleyan and a guy from the SHOFCO Youth who was also here last year. The three of us must constantly come up with ways to entertain the girls lest they start to get rowdy. And let me tell you, these girls can get rowdy. Girls coloring on tables, girls spilling entire jerry cans of water, girls squirting toothpaste all over their hands, girls getting their faces tangled up in bubble gum, girls ingesting crayons. I have yet to encounter this last one, but Jolie, another Pre-K teacher, has. One of her students apparently likes to eat everything and has accomplished the feat of eating her entire name tag and part of her sleeve. Good luck there, Jolie! Wednesday marked the first full day of the Summer Institute. Each of us assisted or led two lesson plans (two groups of girls for one lesson in the morning and two groups of girls for one lesson in the afternoon), as will be the schedule for the rest of the trip. I assisted in an origami lesson with the older girls, taught by Nicos and assisted by the other Lily on this trip. Nathan and Alix found this funny, as did all the girls. In the afternoon, I assisted in a spelling test lesson for Pre-K and K, led by one of the SHOFCO Youth. Successful for Kindergarten! Not so much with Pre-K. They were permitted to color instead. Thursday followed similarly, with the same lessons. We teach classes to each grade individually for 1st-4th grade, but for Pre-K and K, because there are so many girls, we teach the class six times. THERE ARE SIX CLASSES WORTH OF TINY CHILDREN. EIGHTY CHILDREN. Both days required two cups of coffee in the morning and a cup of chai at KSG (a delicious tea drink and the only reason I can out-last the children), but they went smoothly, and I never REALLY lost the attention of any of my girls. I increasingly appreciate Pre-K nap time. The girls PASS OUT. It takes them a couple minutes to come in and settle down after lunch and recess, but once they’re out, THEY’RE OUT. They fall deeply asleep, snoring and drooling, only to be woken up 10 minutes later for their afternoon lessons. I have to admit that one of my favorite parts of the day is trying to wake these poor girls up. They always look so confused, and every time I turn my back, they pass out again. I feel like my mother, making these girls stand up to prove that they won’t go back to sleep. Anyone from last year’s Summer Institute can attest to how fun it is trying to wake them up. Stacey in particular, a Pre-Ker last year, became famous in our group for this. She’d hold her head up and it would crash back down on the table. She’s a little bigger now (too old for nap time), and her voice is a little lower, but she still gets what she wants. All little children with eyes that big do. It’s just the rules. 2nd grader runs through the course. Teacher Lily asks what the capital of Uganda is. 2nd grader answers The capital of Uganda is Kampala. Teacher Lily ponders how 2nd grader knows more than she does. 2nd grader runs back to her team screaming with happiness. Friday afternoon, after the girls went home, the American volunteers stayed behind to participate in a dance rehearsal with the SHOFCO Youth. The first hour required push-ups, sit ups, squats, high jumps, pain, some more sit ups, and some more pain, among other things. The second hour started with warm-up dances that proved surprisingly difficult for the Americans. Sorry I can’t move the lower half of my body independently of my upper half. After warm ups, the boys and girls split up and each group had to come up with a dance to show to the other group. The boys performed first with a dance which involved many complex and exhausting moves. Then the ladies performed and it was essentially 2 minutes of shimmying supplemented by arm movements and a few leg steps. Unbelievably fun. Unbelievably embarrassing. I still feel sore, and that was a week ago. I finally slept in on Saturday, waking up at 8 as opposed to 7, and what a difference it made. Once we were all up, the group went to a nearby mall to register our phones and shop around. We went to Java, a cafe chain and a favorite of last year’s group. We went every weekend last year, so I was very pleased to finally return there. Saturday night, the Oberlin girls made plans to meet up for dinner with two friends of ours from school. The two brought a few friends with them to dinner and we all ended up having a blast. At the same time, the rest of the group was out to dinner. After dinner most of us met up at a bar and spent the night mingling and enjoying ourselves. Sunday, I am happy to report, I slept until 9:30. A new record for me in Kenya. I sat around all day and felt very pleased about it. Monday marked the first day of our second week, and I led a Pre-K/K class, creating a class mobile. Girls drew and colored pictures of KSG and other SHOFCO-related things and cut them out. The teachers then hole-punched and hung the pictures up on a coat hanger. It was easily one of the messier experiences I’ve ever had. Paper littered the floor, the tables, and the girls’ hair. Although it has been brought to my attention that I have yet to use paint with these girls. Point taken. The week passed with lessons in mornings and afternoons, split up by lunch, recess, and nap time. I like nap time less now as I realize it means less time spent jumping rope with my girls. They are a BLAST to play with, and I find myself thinking just FIVE more minutes? Wednesday night the whole group, both American volunteers and SHOFCO Youth, went to dinner at a local Ethiopian restaurant. To my siblings at home who frequent the delicious Ethiopian restaurants in Atlanta: this one was way better. I felt like such a know-it-all, correcting the pronunciation of injera, the spongy bread used to eat the other foods on the plate. I tend to avoid talking extensively about my family demographics as the conversation often drags on a few hours too long, but going to that restaurant, I couldn’t help but make comments like Wait til I tell my family how good this is and No, no, thats shiro. It’s made of chickpeas or Careful. That wine is strong. People gave me How do you know this? looks, and I was obliged to explain my position as part of a minority of white American-born children in my family. The night itself was a blast, and we were all really excited to get a chance to hang out outside of school, where our conversations are limited to Have you seen the Horse animal group? Can I borrow some hand sanitizer? or What do I do with a girl who just had an accident? Aaron and Nicos show off their clean ethiopian platter. Thursday was 4th of July, and the group went out to a celebration at the Chapin teachers’ guesthouse restaurant. They reserved the entire space and decked it out with ribbons, flags, and red, white, and blue Kanye West shutter glasses. We had another great night of hanging out, the Americans and SHOFCO Youth, and I particularly enjoyed talking to the Chapin Teachers. They’re wonderful smart women. Then came Friday, and Fridays mean Field trip! Eighty Pre-K/K girls in a charter bus headed for the giraffe centre. Eighty Pre-K/K girls in a charter bus headed for a crocodile park. Eighty Pre-K/K girls vomiting from car sickness. Eighty Pre-K/K girls screaming bloody murder as the crocodiles moved slowly around in their pens. It was hot and stressful, but it was all worth it to see those girls experience the thrill of a near-death experience by caged crocodile. The older girls (grades 1-4) went to 14 Falls, a park surrounded by waterfalls. They walked around, took boats across the water, hung out, laughed, enjoyed maturity, while my eighty 5-year-olds hoarded hot dogs in their pockets and got lost in giant crowds. Fortunately my bitterness was assuaged because their bus ride to and from the waterfall park took 3 hours. If our ride had taken 3 hours, all sanity I ever had would no longer exist. My animal group on the field trip. Yesterday, Saturday July 6th, the whole group (which I’ll just use from here on out to describe American volunteers and SHOFCO Youth) went to Hell’s Gate, a park about an hour and a half outside Nairobi. We took a bus and sang the entire way there. The SHOFCO Youth sang beautiful traditional songs, harmonizing perfectly, and then gave us the floor. We sang songs like Wagon Wheel, Ignition Remix, and some Backstreet Boys classics. Sorry? Our hike consisted of two parts. The first was a 7 km walk along a dusty road through low hills and grasslands, populated by zebras, warthogs, buffalo, and giraffes. The second part took place after we stopped for lunch. We jumped down into a gorge and hiked through there for several hours. UNFORTUNATELY seven of us got separated and ended up taking a wrong turn. We wandered in one direction for twenty minutes, only to realize we were walking in the absolute wrong direction. We turned around and walked for a while through a part of the gorge I vaguely recognized from last year. At one point our small crew saw the word SHOFCO written into the mud. We took this as a sign that the rest of the group was looking for us (they weren’t). We walked longer, asking passersby occasionally if they had seen a large group of white people walking that way (they had; we’re hard to miss). We finally heard voices around a corner and found our group! We ran to catch up and began to hug everyone. Some of the group looked confused and others hadn’t noticed we were missing. So much for the glorious reunion. Nathan claims he saw us walking just ahead of everyone else. We still felt very brave, and I feel almost closer now to my group of lost souls. The rest of the hike was spent climbing up and down rock formations, exploring the gorge. At the end, we climbed out of the gorge and ended up on top of the world (too cheesy?). It was exhausting but incredible, as the cliff on which we stood was apparently the inspiration for the unspeakable gorge scene in the Lion King. You know, the scene that caused the end of my happiness when Scar throws Mufasa off a cliff? WHY WOULD SCAR DO THAT? That night, after dropping off the SHOFCO Youth, the Americans went to...another Ethiopian restaurant (our third this trip). I realized last night I have eaten more Ethiopian food in the span of two weeks than I ever had in that span of time before, which I find surprising as there is always Ethiopian food brewing in my family’s kitchen. That brings me to today. I slept til 9:45, and at 3pm I am still in my pajamas. I won’t apologize. On Monday, orientation shifted to the guesthouse where our American volunteers are staying, where we had an intensive day of lesson planning, making sure that lessons were polished and ready to go for the KSG girls. We were joined by the incredible team of teachers from the Chapin School – an all girls school in New York City. Teachers from Chapin have partnered with The Kibera School for Girls during the last two summers to join our teachers for three weeks of professional development work. We are so happy to have them with us for a third year! On Monday, the Chapin teachers spent the morning working with our volunteers on how to approach the literacy sessions they will be leading every morning with their “animal groups”. They also gave out some teaching tips and tricks, invaluable to SI participants about to start leading lessons. The Chapin teachers lead a literacy training. In the afternoon, we had two lesson planning sessions. There are so many amazing ideas! We don’t want to ruin the suspense by telling you what topics will be taught, but let’s just say the girls are going have so much fun – and learn a lot too! As the lessons happen, we’ll make sure to tell you about them! At the end of the day, Jessica and Kennedy joined us to tell the story of SHOFCO and the Summer Institute. Both were so humbled to meet the Summer Institute volunteers, and thanked them for devoting their time to the Kibera School for Girls. They chatted with participants, got to know them better, and welcomed them to the SHOFCO movement! Kennedy and Jessica join the SI team! Tuesday was the last day of orientation – a full day at the Kibera School for Girls, with an all-school kick-off assembly at the end of the day! The morning was spent making some last minute touches on past lesson plans and coming up with new ideas. The whole school was so excited for the assembly, and the morning flew by. After recess, the girls assembled in our Great Hall and waited at the edge of their seats for their Summer Institute teachers to join. The SI team entered to a murmur of excitement and the assembly began. Select KSG teachers and students spent last weekend learning to play the recorder from an expert teacher from the United States. They performed four pieces from their impressive new repertoire. It was the perfect way to start of the kick off assembly! Not to be outdone, the Pre-K girls performed a few of the poems they’ve been working on for the National Poetry and Elocution competition. “My Mom is My Best Friend” was so cute and released a flood of Oohs and Aahs from everyone watching. After the school poems, the SHOFCO-Youth theater department graced the stage with a traditional dance performance of incredible intensity. Neighbors from around the school rushed to the windows and doors to get a glimpse of the youth’s dancing. Non-stop drumming and dancing ended with a massive applause. The SHOFCO Youth performing a traditional dance at our kick-off assembly! It was a perfect assembly – what a way to start the Institute! It has been fantastic to see how well the Summer Institute team of SHOFCO Youth and American college students have come together over orientation. It’s hard to believe everyone met less than a week ago! We’re so excited to see what they accomplish with our students at The Kibera School for Girls! The girls finally get to meet their animal group teachers! Thanks for following all the happenings at the Summer Institute. As always, make sure to keep up with everything at Shining Hope for Communities by following us on Facebook and Twitter! Make sure to engage with us there, and in the comments below -- we love to hear your thoughts! Hello from the Summer Institute! Our college volunteers landed in Kenya last Friday and we’ve had a jam packed four days of lesson planning, songs and games, ice breakers, and a whole lot of fun. Orientation has been a tiring (Jet-lag is a tough thing to shake off! ), memorable affair. It’s hard to believe that just a few days ago most of us had never met. Now we’ve got a strong-knit team that’s ready to dive into the Institute head-first. Despite our American volunteers arriving late on Friday night, we started off Saturday at 9am with a welcome meeting. After chatting about SHOFCO and what exactly we would be doing during the next month, we were fortunate enough to be joined by Donna Pido, a longtime friend of SHOFCO. Donna has been living in Kenya for many years, including many years with the SIT-Nairobi study abroad program (The program our COO, Jessica Posner Odede, was a part of when she met our CEO, Kennedy Odede). Donna is extremely knowledgeable about Kenya – its culture, its politics, its people – and can provide invaluable advice to people spending time in the country. We were so happy she could join us for the third year-running to help welcome our SI participants. On Saturday afternoon the American hopped in a few vans and drove to Kibera. For people who had travelled around the world to spend time at SHOFCO, this was the day they would actually get to see the site with their own eyes. We stopped at our community center, our clean water tower, our health clinic and, finally, ... The Kibera School for Girls! The SHOFCO-Youth Team were there waiting for us, and right away we started in on ice breakers, with the always energetic Nicos – one of our assistant coordinators – leading an array of songs, dances, and games. The participants were able to let their inner kid out and play games like Balance the Ball, Ride that Pony, Maua Maua, I Love You I Love You, and Splash Boom – all KSG favorites! When the end of the day rolled around, no one wanted to leave, but with hugs & promises to see each other the next afternoon, we called it a day. Tr. Nicos energizes the group! Sunday morning, the Americans read a very important and relevant New York Times op-ed that we pass out to every Summer Institute group: “Slumdog Tourism” by our CEO Kennedy Odede. Volunteers read the article and then had a very in-depth discussion about what it means for them to be invited by the Kibera community to participate in the Summer Institute. On an issue like this, with no clear “answer”, volunteers agreed that they had to engage in a dialogue and equal exchange with people from Kibera. They know that they have to listen more than they speak, and that they will almost certainly learn more – from the KSG girls, from the SHOFCO Youth, and from the Kibera community as a whole – than they teach. That being said, we’re excited to see the many incredible ways that our SI participants give back, both here in Kenya and when they return home as SHOFCO ambassadors! Sunday afternoon, the group again came together in Kibera to continue to get to know each other. In addition to many name games and songs, we also began to work on what games, songs, and lessons we would be teaching to the KSG girls during the Summer Institute. It was fantastic to see how many games and songs were brainstormed by the end of the day. Let’s just say the girls at the school are going to have an amazing time! Check back for Part 2 for a recap of the last two days of orientation, where the participants get serious about lesson planning and finally get to meet the girls! SI '12 participant Lily Samuel has returned to Kenya this year and is blogging about being back at the Summer Institute as an assistant coordinator. Now I know when telling a story, one is supposed to "begin at the beginning and go on till you come to the end" but--sorry Lewis Carroll--this literally cannot wait. I SAW MY GIRLS TODAY, AND IT WAS THE BEST THING EVER. Moving backward... I entered the Atlanta airport on Monday, June 17, 2013, 1:00 pm EST and left the Nairobi airport on Tuesday 9:00 pm EAT (East Africa Time). That, ladies and gentlemen, is 25 hours of fun-filled travel. And when I say fun-filled, I mean fun-filled. I got trapped in a shuttle on two different occasions (Atlanta, NY); somehow chose my seats for the NY to Amsterdam leg smack in the middle of a program group, all wearing matching lime green Polos; got lost in JFK (how was I supposed to know Terminal 4 and B Gates were the same thing? ); and of course watched the new Nicholas Sparks movie (the religious Kenyan man sitting next to me didn’t enjoy it quite as much). Got to the guesthouse a little before 10, and the head of house had decided to put me (for the first two nights) in a suite, complete with queen-sized bed and personal bathroom. I mean...why not, right? If only that had at all soothed the panic attack I had from midnight to 5 am, but we don’t REALLY need to talk about that. Jet lag is a judgment-free subject. Tuesday morning (yesterday) I woke up early and met up with Alix and Nathan (the group leaders); together we went into Kibera. It was my first time being back in a year, but not much had changed. It seemed as though the same people were still out, selling fish and tomatoes, blasting Kenyan pop music, and doing each other’s hair. Children run around, playing with each other and when they spot us, they stop, whisper muzungu (white person), and begin to chant Howareyou?Howareyou?Howareyou? Nothing’s changed. But then I arrived at KSG and realized things had most certainly changed. 41 new Pre-K girls! I don’t know if many of you have worked with children that age, but if anyone has ever played an advanced level of Jezzball, it’s a similar experience. That was my first surprise. My second surprise came when I saw the Kindergarteners. They’d grown so big, and...calm. The was one little girl in particular who gave everyone a hard time last summer--never sat down, constantly threw things, screeched frequently, and gave a pretty intimidating stink eye. This year Rhoda is calm! Polite! Sweet! SI 2012 kids: I promise I'm not joking. She came up to me, gave me a hug, said Hello Teacher Lily, then ran off to play. WHAT?! I mean...WHAT?!?! Alix and Nathan then introduced me to this year's SHOFCO Youth volunteers, and we began our lesson- planning. They all seemed incredibly animated and excited to have been chosen to be part of SHOFCO. Their lesson plans were innovative. I think they’ll all get along wonderfully with the American volunteers. Most of the third and fourth graders were out at a poetry competition, but I luckily spotted Exference, the only fourth grader still at school that day. She enthusiastically dragged me to recess to insist that I join her in an incredibly bewildering game involving plastic cups and tiny bean bags. I feel shy with the younger girls, unsure if they remember me, but I know without a doubt that the fourth graders know me. So I was thrilled to see Exference. I returned to the guest house happy with the day, ate a big dinner and passed out early, but not before watching a riveting episode of Nigerian Idol. Exference, current KSG 4th grader and a part of Lily's 3rd grade crew in last year's Summer Institute! This morning, I walked the half-hour through the city again to meet Alix and Nathan and we drove again to Kibera. We worked on some SI logistics and had a lunch of cabbage and ugali. Suddenly I heard giggles and there they were! My girls! Joyce and Eunice ran to greet me, followed by the rest of my crew. Yeah...I freaked out. They took me to recess where we once again played the cup game. I asked another girl what the rules of this game were, and Exference, standing behind me, screamed Lily! It is the game we played yesterday! Same game! Yeah...thanks. I realized that. I was so happy to see the girls again, taller than they were a year ago and even more spirited. The day in Kibera ended, and Nathan, Alix, and I went to their apartment to have a potluck with their friends. I met a lot of incredibly nice people as well as Colin, Alix’s stuffed penguin. Turns out we both love penguins. I suppose that’s irrelevant information, but this my blog, so I get to talk about my life. The guesthouse, by the way, is BEAUTIFUL. There are comfortable suede and leather couches in the main room and this giant chandelier that I can’t stop staring at. The rooms have comfortable beds and giant closets. We even have a pool, although as it is the dead of winter here (aka 60 degrees), we probably will not go swimming. Right now there are only a couple people here, but everyone else arrives tomorrow, and then party will begin! We are very lucky to have a SI '12 participant, Lily Samuel, coming back to assist us with this year's Summer Institute. Lily was a wonderful volunteer last year, spending a lot of her time at KSG with the Third grade class. She has also become a leader at SHOFCO-Oberlin, Oberlin College's Shining Hope for Communities College Chapter (check out their mid-semester update that they shared with us this year). She will be blogging about her return trip to Kibera, and we'll be sharing her personal thoughts here. Thank you so much, Lily, for your massive contributions to SHOFCO in Kenya and in the US! We can't wait for you to come back to the Kibera School for Girls! I'm happy to announce the first ever blog post of Lily G. Samuel, rising senior at Oberlin College, Oberlin, Ohio, USA. I first began working with Shining Hope For Communities (SHOFCO) my sophomore year when Sarah Feigelson, a close friend of mine, came back from Kenya filled with excitement about a program with which she had worked. She hoped to start a chapter at Oberlin. I didn't quite understand the organization, but the keywords EDUCATION, WOMEN'S EMPOWERMENT, and KENYA certainly got my attention. My family is what you would call unique. I am the youngest of four biological siblings, with five younger siblings adopted from Ethiopia and Bulgaria. My family's composition and my own visits to impoverished communities in Bulgaria and Ethiopia have inspired my interest in working with underprivileged children, but until Sarah came along spouting acronyms like SWEP, KSG, and SHOFCO, I had not found an outlet. BOOM. I was hooked. I joined Sarah in the launch of SHOFCOberlin. Over the last couple years, we have worked incredibly hard to get our name out on campus, hosting fundraisers, movie screenings, and speakers. Last summer, Sophie Mortner (another Oberlin student and this upcoming year's co-chair) and I volunteered for the SHOFCO Summer Institute. It was one of the most rewarding, life-changing, informative experiences I've ever had. Yeah, it was that good. Painfully early mornings, exhausting days with the girls, and evening lesson-planning when all you can think about is sleep brought the volunteer teachers—American and Kenyan, closer together. We stayed up late playing games and reviewing the day’s most adorable moments: Rhoda followed Kenny around all day, Melissa was wearing her awesome hat/scarf again, Stacey wouldn't wake up from her nap, Eunice created her own version of Splat, Bang, and so on. We marveled at the children’s unparalleled ability to bring joy to every corner of the school. Giggles emanated throughout the hallways, and we all smiled when the girls announced things like, “My favorite color is color purple.” “My favorite color is color blue.” The girls are brilliant, striving to be pilots, doctors, teachers. Working with them inspired me to work harder for SHOFCO this past year, because they deserve all the success and happiness in the world. Leaving the girls at the end of last summer was painful, and I cried hard. When would I see these beautiful girls again? I pictured that the next time I would see Joyce, a third grader, would be 50 years from now, on TV, accepting a Nobel Prize. Then BOOM, SHOFCO struck again. I, Lily G. Samuel, get to return to Kibera to see all the girls I have missed so dearly and have worked so hard for. I AM SO EXCITED I CAN BARELY CONTAIN MYSELF. I wait impatiently for the day I begin catching the planes to travel halfway around the world to see them; I day-dream about walking through the red doors of the school again, seeing the girls again, seeing the finished playground. They'll be older. The off-the-wall Pre-K’ers may have settled down (a little). The 3rd graders I taught will have grown into 4th-graders. Summer Institute's Third grade crew. All I'm saying now is: I'm not promising I won't cry the second I see them again. And don't even get me started about the SHOFCO Youth—local teenage volunteers. The wonderful, hilarious, down-to-earth SHOFCO Youth enriched our adventure last year, showing us their dance and theater performances, allowing us to join in on a Community Clean-Up. They joined us on hikes and we went to dinners together. Working with the Youth helped us better understand the community we had entered. I know this year's volunteers will benefit hugely from working closely with the Youth. I leave in nine days and yes, I have made a construction paper link-chain that counts down the days til I go and until that day comes, I'll just look at pictures, watch videos, and endlessly leaf through the love letters the girls gave me. Welcome to the Summer Institute! Welcome to the 2013 Summer Institute Blog! We’ll be posting regular updates from this year’s Summer Institute here. 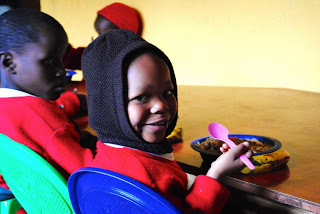 Please check in often to read stories and see photos from The Kibera School for Girls! Right now we’re preparing for the Summer Institute to start in exactly two weeks. We’ve been preparing for several months for the program to start, and we are so excited that it’s almost here. We have an incredible team of volunteers coming to KSG this year from outside Kenya. Volunteers went through a rigorous, very competitive application process and we feel lucky to have them. They’ll be traveling to Nairobi from colleges all over the US – from Stanford, NYU, Barnard, Wesleyan, Oberlin, and more! In preparation for the SI, everyone has been responsible for coming up with detailed lesson plans of the activities and games they’d like to do with our students. We have some great ideas already. Our favorites include: We can’t wait for them to arrive and hit the ground running! Not to be outdone, we also have an incredible group of SHOFCO Youth that will be participating in the Institute. These college-aged youth are from Kibera, and are involved with SHOFCO’s programs, including the football program, the theater program, and the Ghetto Mirror, our youth-produced newspaper. We’ve been fortunate enough to have many of the leaders and stars from these programs join our SI team! We’ve been meeting for the past several weeks, planning for the program and coming up with lesson ideas. The SHOFCO Youth team is really looking forward to meeting the American volunteers and to getting to work in the Kibera School for Girls! A Summer Institute lesson in action! In addition to this team, we will be having two participants from last year coming to join us as Summer Institute Assistants – Lily and Nicodemus! These two are wonderful and will be able to help this year’s participants throughout the program. The day after the American volunteers arrive we will begin our orientation. Orientation is a chance for the Americans to learn more about Kenya, Kibera, and SHOFCO. It will also be a time for the SHOFCO Youth to meet the Americans, and vice versa. During orientation, volunteers will also work to polish up their lesson plans so that when they normal schedule begins the following week, they will be ready to go! We’ll continue to share more as the program quickly approaches – and of course will be updating this routinely to let you know what is happening at the Summer Institute. As always, we also highly suggest you follow us on Twitter and like us on Facebook so that you can always know the latest from the ground! To see more photos from the 2012 Summer Institute check out our Facebook album! The 2012 Summer Institute Crew!